These days, viewing on-demand isn’t just about catching up on programmes that have already been shown in the linear schedule. Increasingly, broadcasters are making the whole series of a show available on-demand on the day the first episode is transmitted – so people can get ahead with a series, viewing episodes prior to their appearance in the linear schedule. This is a practice sometimes referred to as stacking. BARB can now track these new patterns of TV set viewing behaviour that combine on-demand, live broadcast viewing and catch-up – perhaps predictive of the shape of viewing in an on-demand world. The Tunnel: Vengeance is the third series of the British-French crime drama The Tunnel. It aired on Sky Atlantic in December 2017, with all six episodes released on-demand on the day of the broadcast debut of episode one. 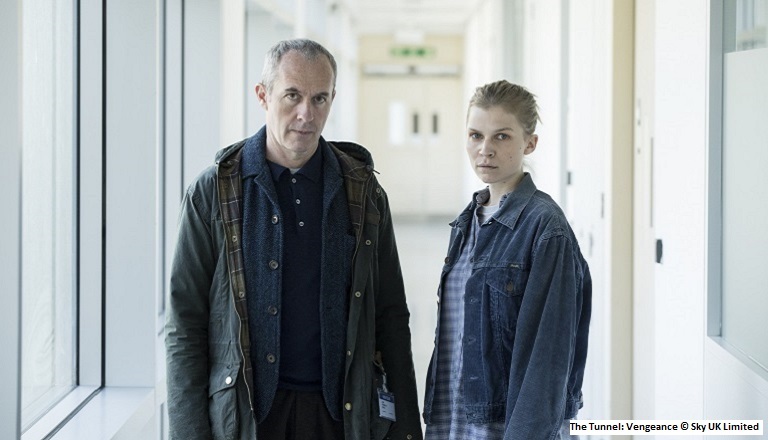 Fans of the first two series of The Tunnel were no doubt looking forward to the debut episode of series three. Of course, they couldn’t watch episode one in advance, but hardly anyone viewed it live, depending on timeshift or on-demand to catch up afterwards instead. And that tiny proportion of episode one viewed live was characteristic of the whole series, with even smaller percentages for the later episodes, leading to a series aggregate of only 3% viewed live. That’s because the series was viewed almost entirely on-demand, whether pre- or post-broadcast (70% of total series viewing) or timeshifted via PVR (27%). But while the small proportion viewed live was consistent across the series, the difference between viewing in advance of broadcast and catch-up afterwards saw a complete shift across the life of the series. Two thirds of viewing to the final two episodes was accounted for by people watching those shows pre-broadcast. Drama series generally have a slight skew (55%) to upscale ABC1 audiences but looking at the demographic profile of total TV set viewing to The Tunnel: Vengeance, we see that over 70% of viewing was ABC1, with a 50/50 gender split. Indeed, the pronounced middle-aged bulge would also be typical of traditional TV viewing to drama series, but clearly those viewers are making the most of new technologies, with more than half of on-demand pre-broadcast viewing to the series accounted for by the 45-64 age range. We can also now examine the demographics of online viewing on tablets and PCs because we have installed software meters on our panel members’ devices. This information can be combined with the census-level data we have for viewing on these devices. 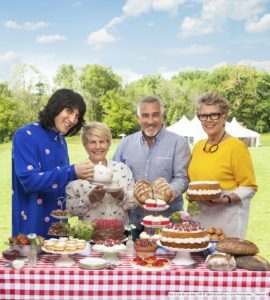 To give an example, census data tell us that the 2017 final of The Great British Bake Off on Channel 4 achieved 311,000 average programme streams, but without BARB panel data, we don’t know how many people that was or who they were. BARB panel data tell us that this represented 397,000 people viewing that episode, which – when combined with the panel’s demographic profile of online TV viewing – can give us the demographic breakdown we see in the chart. The Great British Bake Off has long been credited with boosting the popularity of baking amongst younger audiences, and this was reflected with a healthy 27% of linear viewing to the final accounted for by young adults 16-34. Clearly, for lots of these younger viewers, linear viewing wasn’t an option as they were responsible more than half (53.8%) of all online viewing on devices. And when we say young, it’s clear that viewing this show online was a big hit for our youngest viewing segment of children aged 4-15, accounting for nearly 10% of minutes. With over 46% of its online viewing in the 25-44 segment, it looks clear that the final of Bake Off was a big family online viewing hit. There are perhaps no surprises in the gender skew – online device viewing was much higher amongst women, who accounted for almost 76% of total viewing minutes. 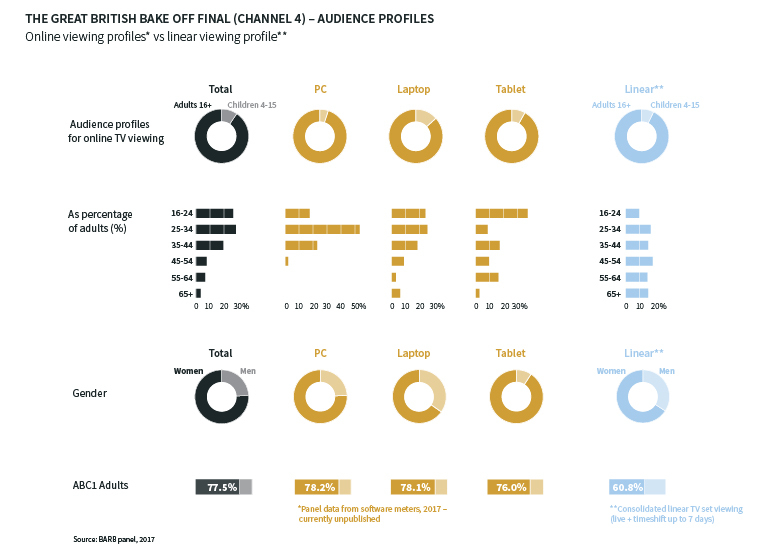 And while linear viewing to this show was skewed strongly to upmarket viewers (60.8%), the proportion of online TV viewing by those viewers (77.5%) reminds us that this typically time-poor audience was determined not to miss out on the Bake Off final. Looking at the age and gender profile of those using each device to watch this particular show, we can see that a disproportionate amount of viewing on tablets is accounted for by younger viewers (16-24s represented 36.8% of tablet viewing to Bake Off); whilst viewing on laptops was also high amongst 16-34s and children 4-15; and more than half of viewing on PCs was by 25-34s – no doubt driven by workplace catch-up. The reporting of non-linear viewing on TV sets like in The Tunnel: Vengeance example is a core BARB panel capability. This is likely to become increasingly important as more broadcasters decide to make entire series available on-demand on the first day of linear transmission. Meanwhile, The Great British Bake Off final demographic insights are a preview of the type of learnings that will come from the next stage of Project Dovetail.